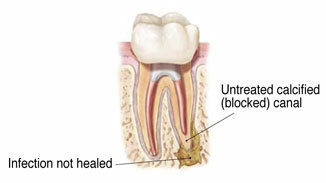 What will happen during retreatment?First, the endodontist will discuss your treatment options. If you and your endodontist choose retreatment, the endodontist will reopen your tooth to gain access to the root canal filling material. 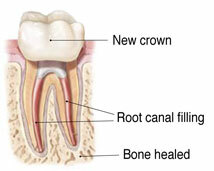 In many cases, complex restorative materials—crown, post, and core material—must be disassembled and removed to permit access to the root canals. 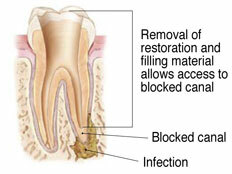 Is retreatment the best choice for me?Whenever possible, it is best to save your natural tooth. Retreated teeth can function well for years, even for a lifetime. What are the alternatives to retreatment?If nonsurgical retreatment is not an option, then endodontic surgery should be considered. 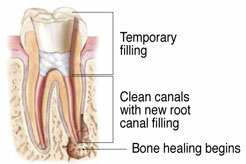 This surgery involves making an incision to allow access to the tip of the root. 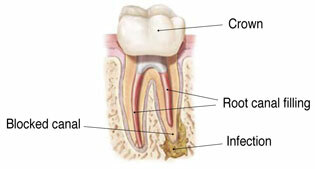 Endodontic surgery may also be recommended in conjunction with retreatment or as an alternative. 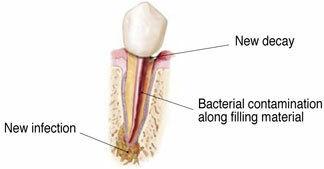 Your endodontist will discuss your options and recommend appropriate treatment. What are the alternatives to endodontic retreatment and/or endodontic surgery?The only other alternative is extraction of the tooth. The extracted tooth must then be replaced with a bridge, removable partial denture or implant to restore chewing function and to prevent adjacent teeth from shifting. Because these options require extensive surgery or dental procedures on adjacent healthy teeth, they can be far more costly and time consuming than retreatment and restoration of the natural tooth.